16 Rinn na Mara is a superb holiday home located in Dunfanaghy, Co Donegal in close proximity to the Golf Club, Killyhoey Strand (beach) and the popular holiday village/resort of Dunfanaghy. The cottage has been built in a modern and yet traditional style with oak and tile floors, a large stone fireplace (with a wood burning stove), a modern kitchen and is tastefully furnished and decorated throughout in keeping with the traditional and modern blended style. It is located close to Dunfanaghy golf clubhouse and it is a 5 minute walk to the beach and also to the village centre and amenities. The area is one of the most beautiful in Ireland and the location enables easy access to Horn Head, some of the finest walks and beaches around and the spectacular indented Donegal coastline. The local landscape changes in response to seasons and daily weather. In the right light at the right time the ordinary becomes extraordinary. The cottage can accommodate up to 8 people in 4 spacious bedrooms. Each bedroom is furnished with luxury oak beds and good quality duvets and linen. The large open plan ground floor of the cottage combines the ease of modern living with comfort. The centrepiece is a ‘local’ stone fireplace. Until recently a teacher in International schools, now a photographer living in Dunfanaghy, Donegal but travelling at various times of the year as a 'travel photographer'. The joint owner of 'Alternative Visions' running workshops and photo tours in Donegal and overseas. 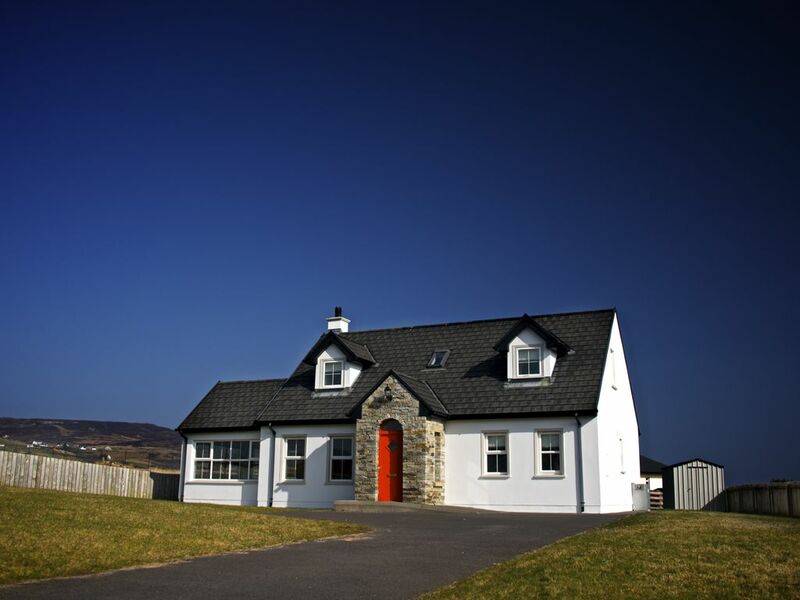 The location is perfect for holiday makers wanting a good location in proximity to a golf course, beaches and the inimitable seascapes and landscapes of Donegal, Ireland. Dunfanaghy is one of Donegal's main 'honeypots' with a small but exclusive ambience. Its location together with the way in which is is planned with space in mind and an interesting blend of traditional and modern. The floors and furniture are modern and all made of oak. It has a beautiful fireplace and wood burring stove with a very modern kitchen and dining area. The four bedrooms are comprised of a mix of 4 single and two double beds. The walls are a gallery of local and some global photography. Lovely house in a great location. Very clean and well maintained. light. The kitchen is well equipped with large fridge freezer, good oven and has a dining table for 8. Next is the utility room with washer and dryer. Ideal. Bathrooms upstairs and down, plus front and back gardens in this enclosed new estate - we had the perfect place to stay. We plan to return. Beautiful home and stunning location! We look forward to our next stay! Cottage was even better than expected from the photographs. Very clean & welcoming.All rooms spotless. Lovely wood burning stove that we made use of every evening & sun room was lovely to sit & relax. Bars,restaurants & golf club all a stroll away. Lovely meal in Lizzies diner & Sunday roast at Arnold's Hotel. Friendly welcoming village & Trevor gave us great information of where to visit & recommendations. Definitely recommended & we will certainly book again. A great cottage, spacious and well maintained. Very warm when using the wood burner. Next to the golf club and 5 minutes to the village or beach. Loads of dramatic coastline to explore. Patsy Dans and the a Rusty Oven highly recommended. The area is renowned for its scenic beauty. This is comprised of beaches, mountains, fresh water lakes and national parks. The area is also well known for photographers, artists and a local music scene. There are many outdoor pursuits available - horse riding, surfing, body boarding and walking along the coasts and in the mountains. Please note payments are accepted in the original currency specified (Euro). The owner may accept other currencies if specifically agreed in advance. Booking deposit (non-refundable) of Euro 200 per week - with balance to be paid six weeks (40 days) prior to the letting period. Dunfanaghy Jazz and Blues (September) is priced at €150 per night.